Lithuania is one of the few Baltic states in Northern Europe. It is a country that once dominated Europe by being one of the largest. It was a long time ago, but its monuments and historical sites led UNESCO to declare multiple World Heritage Sites in the country. Lithuania is rich in history and culture, but they do not lack natural treasures either. In fact, Lithuanians like to describe it using poetry, which is one of the most beautiful things you can witness. If you take a look at a tourism page in Lithuania, you will see that the list of attractions is almost endless. You cannot possibly explore it all in one trip, despite the country’s small size. A trip to Lithuania, however, may involve a trip to the embassy in case you need to get a visa. Lithuania is a Schengen state, which is why the visa you need is a Schengen visa. That rule does not apply if you are from a country that is in the European Union or the European Economic Area, in which case you are visa exempt and you can travel in the Schengen Area as you like, or you are from one of the visa waiver countries in Annex II of the Schengen Area visa policy. In all the other cases, a Schengen visa is required. If you want to find out whether or not you need a Schengen visa, you could take a look at Schengen Area’s visa policy. But we make another suggestion, and that is to use iVisa’s Visa Checker. It is a brilliant tool that gives you that information in just a second. All you have to do is select your country of origin and Latvia in the two drag-down menus. The result will let you know if you do not need a visa, and if you do, it gives you a list of embassies that you can go to and apply for a Schengen visa. 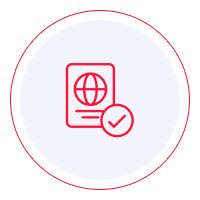 Schengen visas cannot be obtained online, but we would still like to assist you with as much as we possibly can. With that idea in mind, our support service is at your disposal 24/7, and it is free of charge. If you use the Visa Checker and you learn that you do need a Schengen Visa, you must go to the embassy and apply for one. However, there are some things about the issuing embassy as well. If you wish to go only to Lithuania, then you need to visit the nearest Lithuanian embassy. On the other hand, if you plan to visit multiple Schengen countries like many people do, you must go to the embassy of the country that is your main destination. If you cannot tell which your main destination is, the embassy you need to go to is the one of the country that you enter first. The requirements are usually easy to meet, but we recommend that you call the issuing embassy itself to learn about them. It is the most reliable source of information. We regret that we cannot help you any further with the visa application process, but hopefully, the information above puts you on the right track.